On-demand applications are currently in trend and when it comes to the food we all get one name in our mind is Zomato. Yes, Zomato is a big startup in the food industry. Zomato provides online food ordering, food delivery, restaurant information, food and reviewing feature and many more. We will cover all the feature of Zomato in this blog. After seeing these all the below data and revenue you will surely think about having your own application with one thought in mind that “If I can develop one app like this then I also make so much money and will provide good food service”. So don’t be sad that’s also possible. 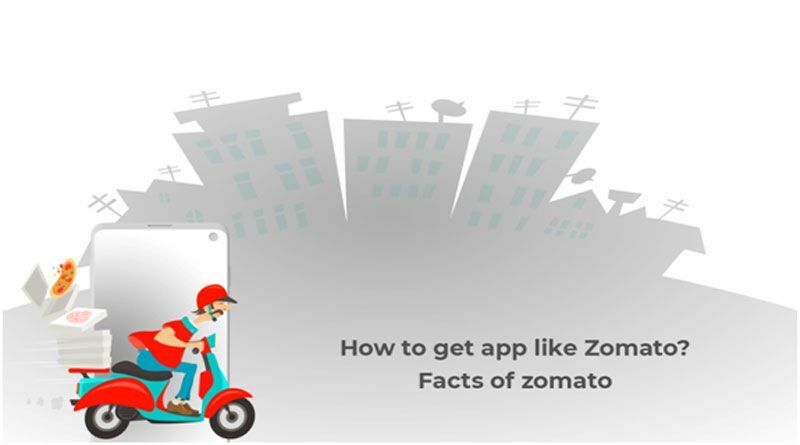 Let’s find something interesting facts about Zomato itself before diving into the app development structure. Zomato was started in the year 2008 in Delhi. The founder of this great app is Deepinder Goyal and Pankaj Chadda. What you think the name Zomato is from starting of this startup? No, it called “Foodie Bay” when it officially launched. Then after in 2010 it was renamed as Zomato. You know Zomato has more than 10,00,000 registered restaurants and currently present in 23 countries. They have almost 90 million plus visits monthly. Their business model is like a restaurant pays to Zomato for being featured on the platform. Then user views the restaurants which are featured by Zomato on the app. The user interface is free of cost. But the vendor or restaurant owner has to pay to Zomato in order to get listed on platform. Zomato hits his annual revenue at 650 crores around 100 million. As per the recent news, Zomato has launched 30,000 sq. ft warehouse in Bangalore. From here Zomato will offer a huge and wide range of food products to the Zomato registered restaurants every day. Before this 30,000 sq. ft warehouse they have 6000 sq. ft warehouse. The move from small to such a huge capacity warehouse now they can store up to 4000 metric ton capacity per month.Now Zomato can serve their service to over 2500 restaurants every day. According to the company, through this platform now restaurants and hotels can buy all kind of vegetables, fruits, poultry, groceries, meat, seafood and dairy products also. We saw that Zomato is currently in more than 23 countries. As the recent news Zomato will sell his UAE based food delivery business to Germany’s Hero group for about the $172 million. Zomato and Delivery Hero will subsequently enter into a service agreement, under which Zomato will continue to run the business on its own platform, Info Edge added. Also after the deal is closed Info edge will own 26.38% stake in Zomato. It operates its food delivery business only in India and UAE. Through this Zomato will increase their funds to compete with the Swiggy in India. Because recently Swiggy raised its fund around $1 billion from the Naspers. So the company value is now $3.3 billion. Zomato has raised an additional $105 million in its ongoing funding round with new investors, including Delivery Hero and Glade Brook Capital. We all read about Zomato above and find that how they earn money and funding. If they can then why not you can. Let’s find out about the actual application. If we divide the application into different modules then you will find 5 different solutions. Zomato itself has features of 5 different applications. You may like: How can the IoT technology enhance the security virtualization? So, if you are looking to build a restaurant guide app like Zomato of your own, you need to clench hand choose how you are going to cover everything and what all functionalities and modules you might want to have and what else as far as highlights and presentation plot you might want to include. In Zomato it allows the user to integrate their social media account to their accounts like facebook, google+ etc. Then Zomato allows them to create the full detailed profile and allows them to connect with each other to discover others, liking their food photos, giving reviews to the food and restaurants. It is not just aggregator but this is a complete social metric that is playing a huge role in making it user based. > Buffet, Delivery, Pure Veg., Bakeries, Luxury Dining, Outdoor Seating, Cafes, Nightlife, 5 Star, Open Now, 24*7 Open, Wi-Fi, Credit and Debit Card. If you want to design your Home screen section of application like Zomato then you need all below elements on your screen. > Nearest restaurant in your locality, Search by area, restaurant, food, etc., Order your food, Trending Places, Food bookmarking, Suggestions, and popular food venues, Quick Search Option, Favorite food collections, My account section for manage profile and orders. From above of which the restaurant listing and rating are the most important attraction of the application. That allows the user to view the food menu, pictures, food critic reviews, restaurant suggestions, based on recent searches. > Banner Slider, Check-in button, calling, like, comment, share, restaurant listing details, restaurant opening and closing timing, Food order, address and map integration, Upload photo, your reviews, avg. meal cost, create a collection. > Level and reward points, achievement, user verification, reputation, location, competition. To get an application like Zomato, all you need is first do research and arrange all that listing data and draw a digital application flow. When you finish your basic research then to develop an app you need a mobile app developer.Get the detailed info and contact the eligible developer or company so that they can help you to chase your dream. Because this is the successful startups and successful application that drive more audience and revenue. So this kind of on-demand applications is more fruitful than others. If you need any help and want to develop an app like Zomato, we at YoungBrainz can assist you.